Austria is a federal republic and a landlocked country of roughly 8.47 million people in Central Europe. It is bordered by the Czech Republic and Germany to the north, Hungary and Slovakia to the east, Slovenia and Italy to the south, and Switzerland and Liechtenstein to the west. The territory of Austria covers 83,855 square kilometres (32,377 sq mi) and has a temperate and alpine climate. Austria's terrain is highly mountainous due to the presence of the Alps; only 32% of the country is below 500 metres (1,640 ft), and its highest point is 3,798 metres (12,461 ft). The majority of the population speak localBavarian dialects of German as their native language, and German in its standard form is the country's official language. Other local official languages are Hungarian, Burgenland Croatian, and Slovene. The origins of modern-day Austria date back to the time of the Habsburg dynasty when the vast majority of the country was a part of the Holy Roman Empire. From the time of the Reformation, many Northern German princes, resenting the authority of the Emperor, used Protestantism as a flag of rebellion. The Thirty Years War, the influence of the Kingdom of Sweden, and the rise of the Kingdom of Prussia, as well as the Napoleonic invasions, all weakened the power of the Emperor in the North of Germany, but in the South, and in non-German areas of the Empire, the Emperor and Catholicism maintained control. During the 17th and 18th centuries, Austria became one of the great powers of Europe and, in response to the coronation of Napoleon as the Emperor of the French, the Austrian Empire was officially proclaimed in 1804. Following Napoleon's defeat, Prussia emerged as Austria's chief competitor for rule of a larger Germany. Austria's defeat by Prussia at the Battle of Königgrätz, during the Austro-Prussian War of 1866 cleared the way for Prussia to assert control over the rest of Germany. In 1867, the empire was reformed into Austria-Hungary. After the defeat of France in the 1870Franco-Prussian War, Austria was left out of the formation of a new German Empire, although in the following decades its politics, and its foreign policy, increasingly converged with those of the Prussian-led Empire. During the 1914 July Crisis that followed the assassination of Archduke Franz Ferdinand of Austria, the German Empire guided Austria in issuing the ultimatum to Serbia that led to the declaration of the First World War. The First Austrian Republic was established in 1919. In the 1938 Anschluss, Austria was occupied and annexed by Nazi Germany. This lasted until the end of World War II in 1945, after which Germany was occupied by the Allies and Austria's former democratic constitution was restored. In 1955, the Austrian State Treaty re-established Austria as a sovereign state, ending the occupation. In the same year, the Austrian Parliament created theDeclaration of Neutrality which declared that the Second Austrian Republic would become permanently neutral. 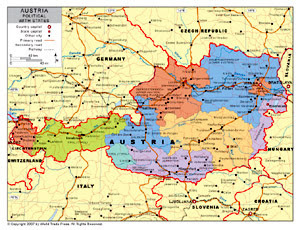 Today, Austria is a semi-presidential, parliamentary representative democracy comprising nine federal states. The capital and largest city, with a population exceeding 1.7 million, is Vienna. Austria is one of the richest countries in the world, with a nominal per capita GDP of $46,330 (2012 est.). The country has developed a high standard of living and in 2011 was ranked 19th in the world for its Human Development Index. Austria has been a member of the United Nations since 1955, joined the European Union in 1995, and is a founder of the OECD. Austria also signed the Schengen Agreement in 1995, and adopted the European currency, the euro, in 1999.